Verify fuel supply and return valves (Figure 2, Item 1) are closed. 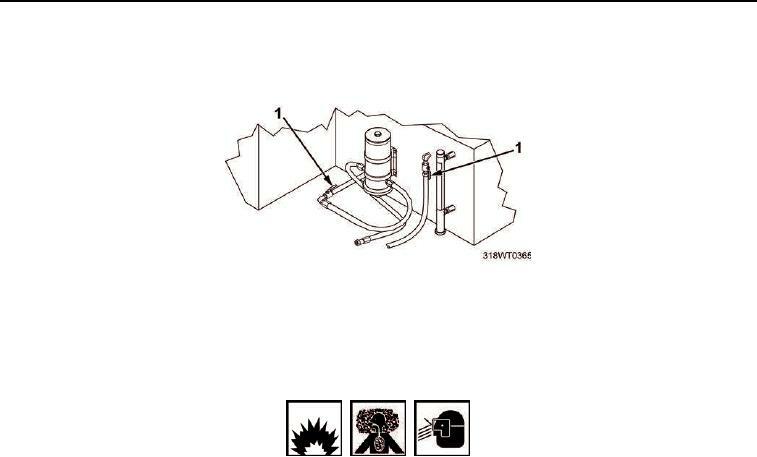 Place a drain pan under fuel lines (Figure 3, Item 2) and (Figure 3, Item 8). Hazardous fumes may be present. Wear protective clothing and goggles while handling. This task is typical for port and starboard engines. (Figure 3, Item 9) and drain fuel into drain pan. Remove fittings (Figure 3, Item 1) and (Figure 3, Item 9) from priming pump body (Figure 3, Item 7). Loosen retaining nut (Figure 3, Item 3) on priming pump body (Figure 3, Item 7). Remove priming pump (Figure 3, Item 4) from priming pump body (Figure 3, Item 7). Loosen nuts (Figure 3, Item 6) on priming pump body (Figure 3, Item 7). Remove outside nut (Figure 3, Item 6) from priming pump body (Figure 3, Item 7). Remove priming pump body (Figure 3, Item 7) from bracket (Figure 3, Item 5). body (Figure 3, Item 7).